Thus it was, on the 10th anniversary of RUST NEVER SLEEPS, that Neil gave a nod to that classic's format by bookending FREEDOM in a similar fashion. In this case, it was with acoustic and electric versions of one song, "Rockin' in the Free World". Here was a song that captured the mood of its time and place like nothing else Neil had released during the '80s. Although, as has been noted elsewhere, its popularity was largely propelled by many people's inability to pay attention to lyrics beyond the chorus itself. In any event, the Berlin Wall came down, and Neil came smashing through (figuratively speaking, of course)! Ann Coulter gives Reagan all the credit for the collapse of the Soviet Union, completely ignoring Neil's contributions. No wonder people think she's extreme! 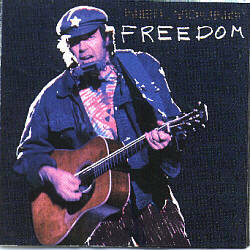 The remaining tracks on FREEDOM also showcase Neil's amazing songwriting abilities. "Crime in the City (Sixty to Zero Part I)" is nearly 9 minutes in length and touches on so many things it's hard to summarize. Just listen when you get the chance! (haahnster note: features our old friend Ben Keith, of Stray Gators fame, on Alto Sax). "Don't Cry" is quite a fine example of a song only Neil would write, offering reassuring words to a woman whose heart he's in the middle of breaking, while the most incredible crashing, bellowing guitar sounds wail through the air. "Hangin' on a Limb" is a really pretty song, featuring good old Linda Ronstadt's backing vocals. "Eldorado" tells a great story, accompanied by mariachi sounds and cool, bluesy electric guitar by Neil. "The Ways of Love" features Linda again, and Ben Keith on pedal steel guitar. "Someday" is absolutely beautiful, with great keyboard work by Frank "Poncho" Sampedro and alto sax by Ben Keith. This is followed by the album's one cover song, which is Neil making "On Broadway" his own, in a big way. "Wrecking Ball" opens with the lyric "My life's an open book", which introduces a series of three seemingly autobiographical tunes ("Wrecking Ball", "No More" and "Too Far Gone"). What an absolutely stellar album!!! Click here for Rolling Stone magazine's 5-Star review. Is this album really 10+ years old??? "I heard Mr. Young sing about her"